412 pages | 543 B/W Illus. The large-scale production of chemicals to meet various societal needs has created environmental pollution, including pollution from byproducts and improper disposal of waste. With the world facing adverse consequences due to this pollution, green chemistry is increasingly being viewed as a means to address this concern. Since most organic syntheses require toxic solvents, more reaction time, and drastic conditions of temperature, conventional methods of organic synthesis are less preferred. Microwave-assisted organic synthesis is considered to be a promising green chemical approach because it reduces reaction time from days or hours to minutes or even seconds, and has many other advantages. It helps reduce side reactions and increase yields, uses fewer solvents or is almost solvent-free, has solid supported reactions, and improves purity. 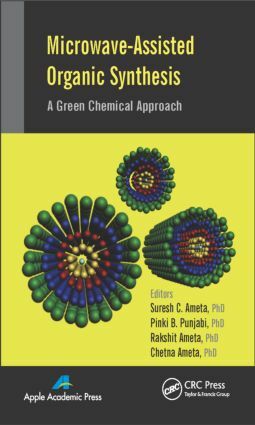 This book’s main focus is microwave-assisted organic synthesis processes, particularly various reactions such as cycloaddition, rearrangement, elimination, substitution, oxidation, reduction, condensation, coupling, polymerization, nanomaterials, synthesis of heterocycles, and industrial applications under microwave irradiation. The time is not far off when this methodology will virtually replace existing and cumbersome methods of organic synthesis. Prof. Suresh C. Ameta obtained his masters degree from the University of Udaipur and was awarded a Gold Medal in 1970. He also secured a first position in MPhil in 1978 at Vikram University, Ujjain (M. P.). He also obtained a PhD degree from Vikram University, Ujjain. He has served as professor and head of the Department of Chemistry at North Gujarat University Patan (1994) and M. L. Sukhadia University, Udaipur (2002-2005), and head of the Department of Polymer Science (2005-2008). He also served as dean of postgraduate studies. He is now serving as director of the Pacific College of Basic and Applied Sciences and dean of faculty of science at PAHER University, Udaipur. Prof. Ameta has occupied the coveted position of president, Indian Chemical Society, Kotkata, and is now life-long vice president, beginning in 2002. He was awarded a number of prizes during his career, such as national prizes twice for writing chemistry books in Hindi. He received the Prof. M. N. Desai Award, the Prof. W. U. Malik Award, the National Teacher Award, the Prof. G. V. Bakore Award, and a Life Time Achievement Award by Indian Chemical Society. He has successfully guided 71 students in the PhD program. Prof. Ameta has more than 300 research publications to his credit in journals of national and international repute. He has also contributed in the form of books. He is the author of around 40 undergraduate- and postgraduate-level books. He has also written chapters in books published by several international publishers. He has completed five major research projects from different funding agencies, such as DST, UGC, CSIR, and Ministry of Energy, Govt. of India. Prof. Ameta has delivered lectures and chaired sessions at national conferences throughout India. He is also reviewer of number of international journals. Dr. Pinki B. Punjabi completed her MSc, MPhil, and PhD degrees from Vikram University, Ujjain, India, and secured a gold medal for her MSc studies. Dr. Punjabi is serving as associate professor in the Department of Chemistry at Mohanlal Sukhadia University in Udaipur, Rajasthan. Her research interests include photocatalysis and photo-Fenton reactions for the degradation of organic pollutants, microwave-assisted organic synthesis, and polymer synthesis. She has supervised 22 PhD students, and 7 are currently working under her supervision. She has more than 100 research papers in journals of national and international repute and has attended various conferences and delivered invited lectures. She has also contributed to several undergraduate- and postgraduate-level books. She has published several chapters in books published by international publishers. Rakshit Ameta, PhD, is associate professor of chemistry, Pacific College of Basic and Applied Sciences, PAHER University, Udaipur, India. He has 8 years of experience in teaching and research. He has published more than 50 research papers and at present is guiding 7 research students for their PhD theses. Ameta has received various awards and recognitions in his career, such as securing the first position in for MSc, for which he was awarded a Gold Medal. He received the Fateh Singh Award from the Maharana Mewar Foundation, Udaipur, for his meritorious performance. He has served at M. L. Sukhadia University, Udaipur; the University of Kota, Kota; and PAHER University, Udaipur. He has supervised two PhD students, and seven more are performing research under his supervision on various aspects of green chemistry. He has around 50 research publications to his credit in journals of national and international repute. He holds one patent, and two more are under way. Dr. Rakshit has organized three national conferences as organizing secretary at the University of Kota in 2011 and PAHER University in 2012 & 2013. He is also planning to organize the fourth conference at PAHER University in 2014. He has delivered lectures at Bhopal, Jodhpur, Palanpur, Rajkot, Dharwad, and Chandigarh. He has chaired sessions in conferences held by the Indian Chemical Society and the Indian Council of Chemists. Dr. Rakshit was elected as council member of the Indian Chemical Society, Kolkata (2011-2013), and Indian Council of Chemists, Agra (2012-2014). He has written five degree-level books and has contributed chapters to books published by several international publishers. Dr. Chetna Ameta was awarded a PhD from M. L. Sukhadia University, Udaipur, India. She was a recipient of JRF and SRF from UGC, India. She is presently working as assistant professor of chemistry at Sukhadia University, Udaipur, and has 16 research papers to her credit. Her research interests are in microwave-assisted organic synthesis and green chemistry.